Today was litter picking day, here in grey and dull Gayton, we have these every 3 months and when I saw the email reminder yesterday I thought 'why not?' I've lived in this village 19 years and always say I'll do it and never have. So I decided that T and I would go whilst The Hubs was out with The Teens. 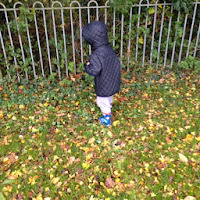 Not only has it been great to get outdoors for a bit today, I think it'll teach T some valuable life-skills and they're ones I need reminding of too! 1. 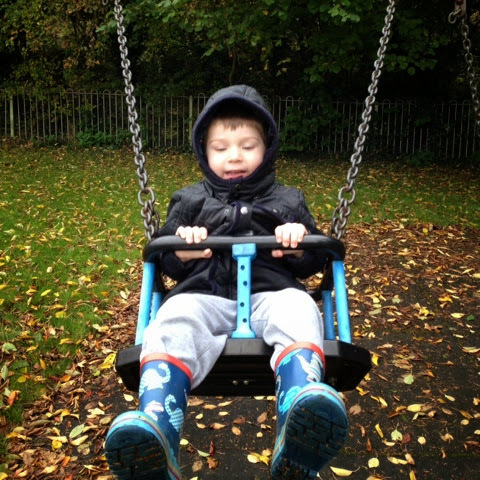 It's lovely to get outdoors! 2. It's nice to do things for others. 3. It's important to clean up mess. 4. It's good to socialise with people you don't know. 5. It's great to be part of the community. T took his plastic grabber, I figured this would be nice and easy to clean afterwards and I doubted they would let him use theirs. Why? 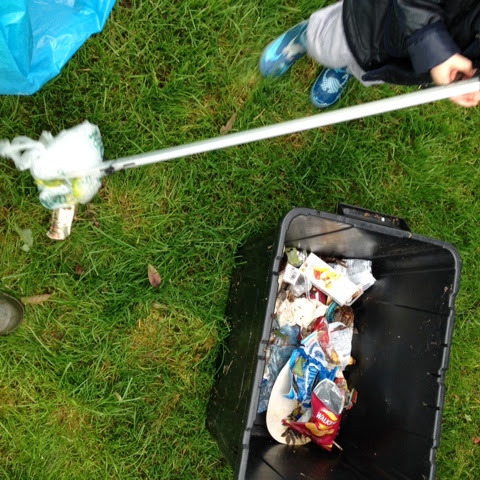 Why did I think that T would want his grabber when he could use the official litter picking one? Yes even before we'd left the organisers house, he'd ripped it out of my hands and was trying to grab leaves off the trees around her patio. 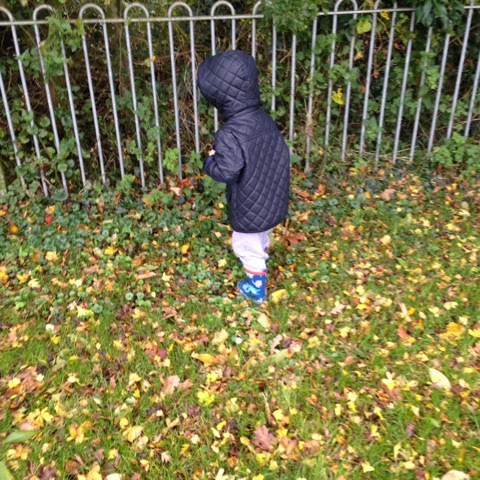 She actually gasped in horror when she saw him do this, so I grabbed the high viz jacket and bin bags she handed me and I escorted him off her drive, once out of the way, I explained if he was good he could use it when we got to the play area, of course with no audience he happily handed it over without meltdown. Anyway, the organiser Joan very kindly gave us the village hall, car park, village green and play area so that it was safe for T, this was perfect for us as this is not a huge area and I was confident we could get round it before T got bored, plus it's close to home. I was advised that another lady had been given Hillcrest Road (where we live!) so I didn't have to worry about that. So off we set, high viz jacket donned, grabbers in hand and bin bag blowing in the wind. We walked towards the car park and what did we see?? 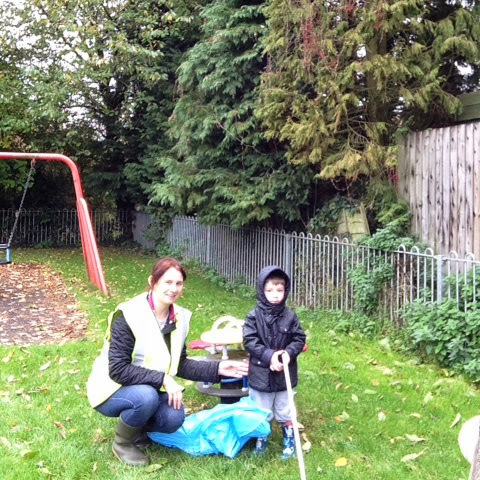 Mrs Hillcrest Road in the play area ...picking...up...our...litter, Mrs Hillcrest Road was on OUR turf!!!! 'Hillcrest Road is my area' she said, now my non-Mummy head was saying 'tell her to do one' (well that's the polite version!) but I smiled sweetly and said 'oh I'm sorry, Joan asked us to do round here so it was safe for my little boy' yes the same sweet and innocent little boy who was swinging the grabber directly at Mrs Hillcrest Road! 'Well you won't find any litter because I've picked it all up' she huffed and walked off. 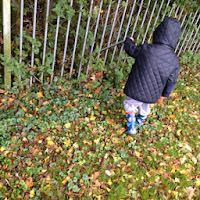 Not wanting to disappoint T - he was dying to pick up litter using the grabber, I promised him a go in the play area then we'd nip home and get some litter for him to pick up, yes really, I was going to get some litter from our bin just so he could do this! Anyway, as soon as we got to the play area T went straight over to the a plastic box which one of the Mum's put there to use as a bin, HA HA, Mrs Hillcrest Road, you are not from round this gaff so you weren't looking for that were you? The box had lots of litter in it!!! 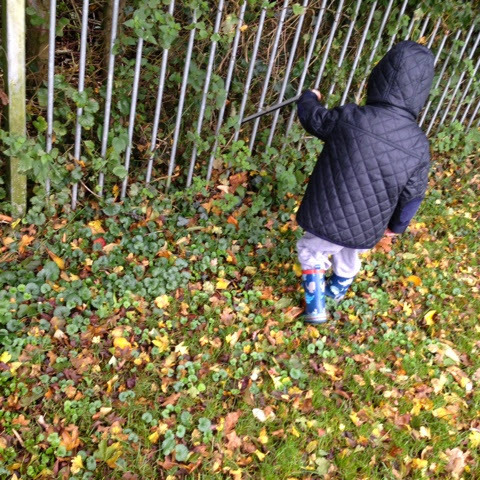 Ripe pickings for a 2 year old brandishing a grabber! Oh how I wish she'd been there still. This also saved me from going wheelie bin diving in our bin, thank goodness. We then took a wander around the perimeter of the park and found a couple of beer cans, and some sweet wrappers so T was very happy with litter haul. 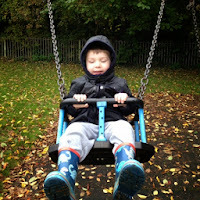 Once we'd collected everything up, T had a little go on the swings, favouring the baby swing as he's allowed to go higher on them. All in all we had a fab time, whilst it didn't really work out as I'd imagined, I'm really glad we did it and we've promised Joan that we will be there again next time. 1. Some people (ie Mrs Hillcrest Road) will pick a fight with anyone and are just jobsworths, ignore these people! 2. There are some lovely people from the village, the lovely Joan, who invited us back for coffee, a nice couple with whom we exchanged pleasantries when leaving Joan's and 2 boys playing in the front garden of 'the big house' who waved at T when he waved at them. 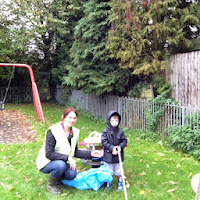 We had a great time and I'm going to get T his own ikea high viz jacket before the next Gayton Litter pick. lovely to see he really enjoyed a task like this - well done to you both! Great that you should have picked the litter and do join us as the national network of individuals in the UK working to eliminate littering as we wouldn't want you to have to keep doing it forever!